People tend not to appreciate their teeth until something happens to them. Losing one or more teeth can have a serious impact on a person’s self-esteem as well as their ability to function normally. Day-to-day activities such as smiling, talking and chewing suddenly become more difficult or outright impossible. In these situations, damaged or missing teeth need to be replaced as soon as possible to prevent further problems such as gum deterioration and facial collapse. Fortunately, the dentists at East Bentleigh Dental Group can provide multiple dental implants that meet your needs. 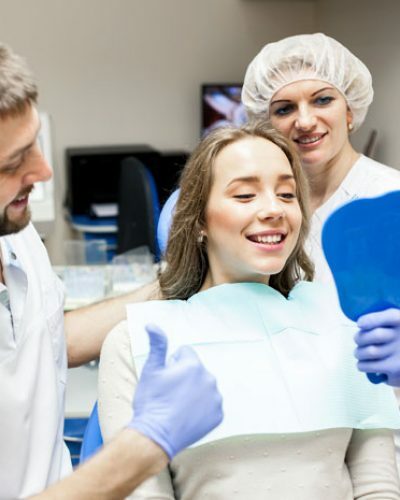 These revolutionary restorative dental solutions can effectively replace your natural teeth as well as some of the roots. They’re designed to be as inconspicuous as possible, restoring the form and function of your natural teeth. We aim to deliver personalised results so that you can go back to living your life without unnecessary difficulty. Placing multiple tooth implants into your mouth is a relatively simple process. First, the implants are placed into your jaw, then the next 2 to 6 months is spent allowing the implant and bone to fuse together. Temporary teeth replacement solutions are generally worn throughout this period. Ultimately, replacement bridges are created that will be attached to small metal posts called abutments, restoring your ability to smile confidently and chew easily. No Support Required – Unlike other tooth replacement treatment options such as fixed bridges and removable partial dentures, multiple dental implants are not dependent on adjacent teeth for support. This means they’re easier to place and there are fewer obstacles that need to be navigated for a successful result. Bone Preservation – Fixed bridges and removable partial dentures can cause deterioration of the bone that previously surrounded the tooth root. On the other hand, multiple tooth implants partially replace the root and integrate with the jawbone. This helps preserve and maintain the health of the bone. Improved Function & Aesthetics – People with missing front teeth are often concerned about their appearance. Fortunately, multiple dental implants can restore your smile and make it seem as if you never lost any teeth to begin with. In addition, implants function just like natural teeth, which means you can resume normal chewing and biting habits. Reduced Costs – Multiple implant bridges reduce the number of implants needed. This means that fewer procedures are required, saving significant amounts of money. This also means that the bone and gums between the implants are untouched, which reduces the amount of time needed for healing so you can get on with your life again as soon as possible. At East Bentleigh Dental Group, our multiple dental implants are second to none. Get in touch with our friendly dentists today to learn more and discuss your requirements.